It is often useful to modify an existing contingency table before further analysis. Contingency table data may be available to you in spread sheet or datasheet form, but not structured exactly as you wish, or with names for factors and levels other than those you prefer. To modify an existing table in ILOG, select Run > Modify This Table. This procedure lets you edit factor and level names, thus changing existing names to the ones you want. It also lets you reorder factors, so that your presumed output factor comes last, and delete factors, thereby reducing the number of dimensions of the contingency table. Additionally, you can reorder levels, lump levels together (useful if some levels have few counts), insert new levels (useful if additional data become available), or delete existing ones (useful if you want to discard cases assigned to a particular level). These functions give you considerable freedom in setting up particular analyses or overcoming technical problems (e.g., eliminating an entire level of a variable in case of few counts). In sum, ILOG provides a number of ways to manipulate and modify an existing contingency table. Exploring these functions with actual data should give you a sense of ILOG’s flexibility and power in this regard. For example, if we had imported the data file described earlier, but decided we did not want to consider Dominance further, we could delete the Dominance factor as follows: select Dominance, right click for context menu, then select Delete Factor (see above). The resulting 2x2x2 table would be displayed by ILOG as shown below. 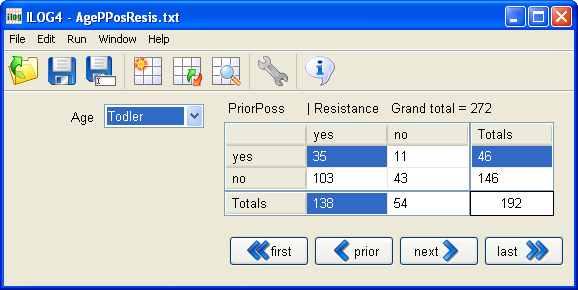 Note that the count for toddlers with prior possession showing resistance is 35, the sum of the two cells with (19) and without dominance (16) from the data file. Bakeman, R., Quera, V. (2011). 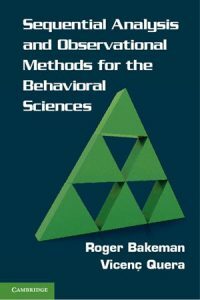 Sequential Analysis and Observational Methods for the Behavioral Sciences. Cambridge, UK: Cambridge University Press. ISBN: 9781107001244 (hdcv), 9780521171816 (ppbk).